Directions: In a medium or large pot, add the oil. Turn heat to medium and heat oil to 350 degrees F.
In a large bowl, add the cornmeal, flour, sugar, baking powder and salt. Stir together. Then add the beaten egg, buttermilk, oil and honey. Stir until combined. (Batter should be a little thicker than pancake batter) Ours puffed up quite a bit. Pour the batter into a tall drinking glass. 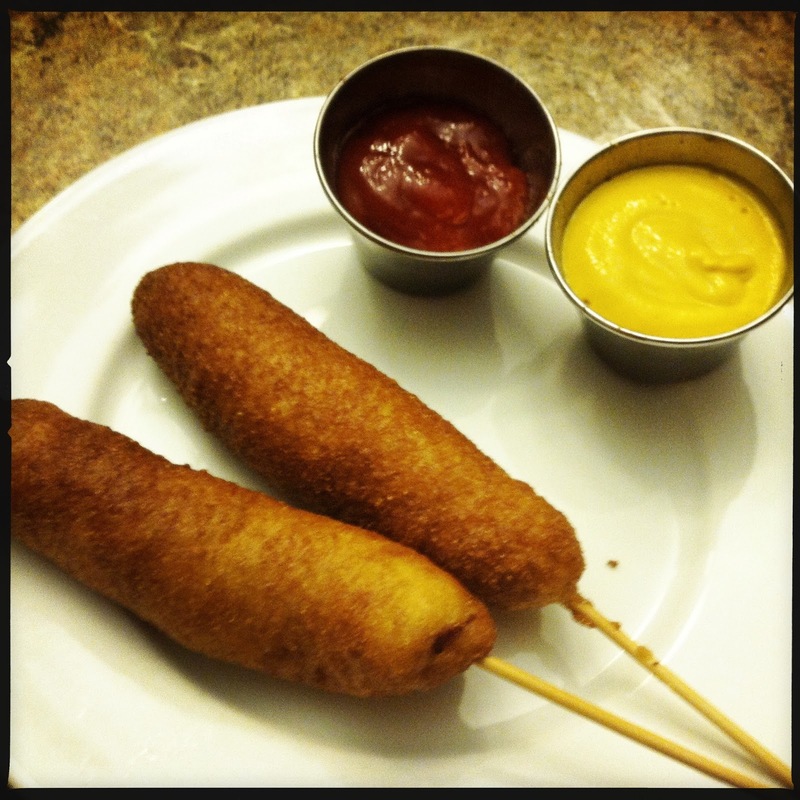 Holding by the skewer, take one hot dog and dunk it into the batter, coating all of the hot dog. We found with the batter being so thick, we twisted it in the cup, pulled it out, and then dunked it again, slowly twisting as you come up. It helps keep the batter from flaking off in the oil. Slowly remove from batter and let a little excess batter drip back into the cup. Immediately place it into the hot oil, while still holding the stick. Turn as necessary to brown all sides. Cook for 2-3 minutes, or until all sides are a deep golden brown. Remove from hot oil and place on paper towels to drain grease. Repeat with all hot dogs. 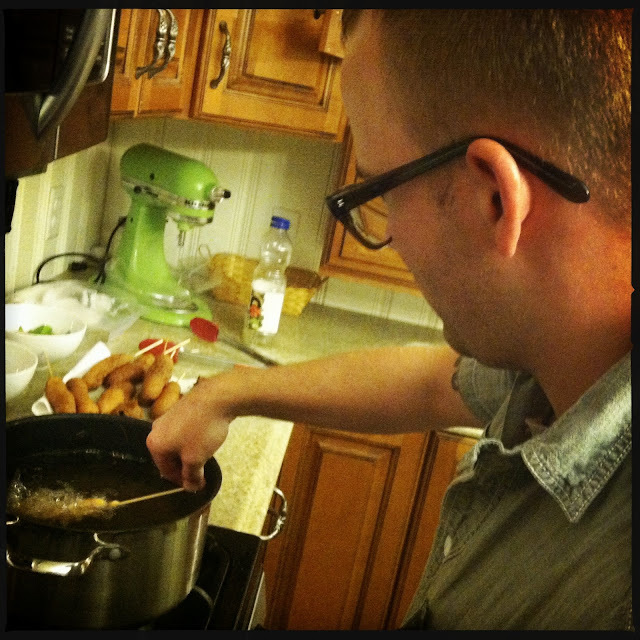 With it being just the two of us, we could not eat all of these corndogs, so I saved a couple for the fridge and put the rest in freezer bags. So later on, we can just pop them in the oven or microwave to heat them up! Thank you Lindsay for this post! 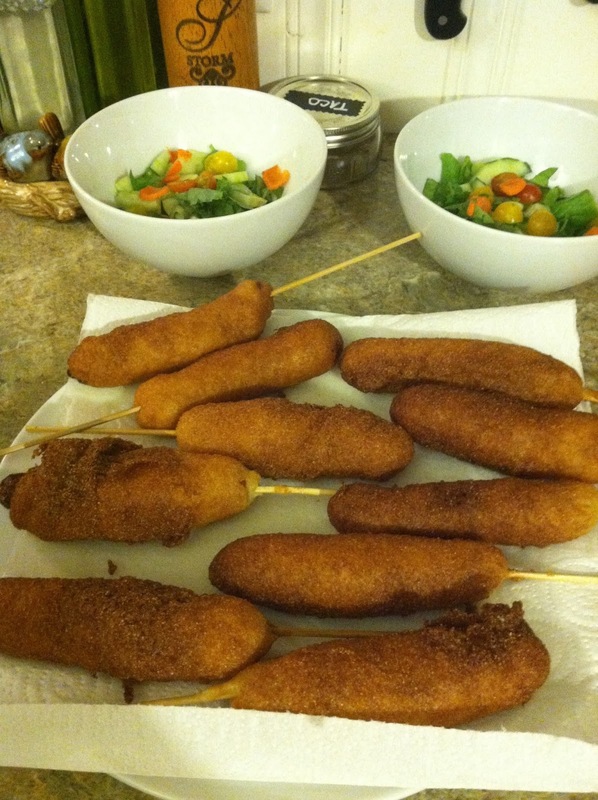 I've recently begun trying a gluten free diet, and one if the things I really miss is corn dogs with my hubby and kids. I might finally be part of the crowd again with this one!